I was born in Northumberland, UK, north of Hadrian’s Wall and almost in Scotland, which technically makes me a Barbarian! I have a scientific background and obtained my BSc in Biology and Geography from the University of Exeter in Devon. My former husband and I moved to USA in 1983 and three years later found ourselves in Fayetteville, Arkansas. It was there that I discovered quilts. I was thrilled to see them displayed on clotheslines outside farmhouses on the back roads in the Ozarks. After hand-piecing 36 Le Moyne Star blocks for my first quilt, I found the local quilt group, Q.U.I.LT., whose members educated and mothered me. They introduced me to the rotary cutter – what a revelation! I loved the endless possibilities as well as the joys of sharing a common interest with other enthusiasts. We moved to Little Rock, Arkansas and I was an active member of the Arkansas Quilters’ Guild, a group which included several exceptionally talented quilters whose innovative approaches to both traditional and contemporary quilting were inspiring and influential. Since 1993, I have lived on beautiful Bainbridge Island, in the Pacific Northwest and plan to stay. My two children Hazel and Thomas have fledged and I'm now a proud grandma. In 1994, I helped make quilts for a fundraiser at my son’s school, Wilkes Elementary. The enthusiasm of the kids blew us away and the auction netted $10,000. We designed the projects to complement the curriculum, and techniques, ranging from drawing and painting on fabric to hand sewing, were selected that were appropriate for the age and skill levels of the children. Later, I made another 20 quilts with children at Blakely Elementary School and the Family Classroom. These projects all appear in my book, Creative Quilting with Kids, (Krause Publications, 2001). My work with children continued at Hyla Middle School and resulted in my second book Patchwork and Quilting with Kids, (Krause Publications, 2003). The book includes a variety of machine projects, from pillows and tote bags, to small quilts and lap quilts, and is suitable for beginning quilters of any age. Both books are now out of print but are still available through Amazon. I moved on to writing books for adult quilters and in Traditional Quilts with a Twist, (Krause Publications 2006), I tweaked traditional patterns to make over 20 new designs. I selected three old favorites, Trip Around the World, Ohio Star, and Bear's Paw on which to base my variations. My traditional roots progressed to designing a new 16-piece quilt block, the Bargello block – a unique approach to Bargello quilting in which the piecing and construction is much simpler than the traditional Bargello technique. The strip sets used contain only four strips and the blocks go together quickly and easily. The design possibilities for arranging these blocks into attractive and creative patterns go on and on. There are many to inspire you in my fourth book Bargello Quilts with a Twist, (Krause Publications 2008). My most recent innovation is devising a template-free method for making Kaleidoscope blocks. This is easy and fun and does not require any special triangular rulers. The technique may be developed further by making large Kaleidoscope blocks, cutting them into nine pieces and switching the pieces to create the new Op-Art Kaleidoscope block. Patterns are available. In June 2004, my daughter Hazel and I went to Mongolia, where we taught quilting in the capital city of Ulaanbaatar to needy women at the New Way Life Mongolian Quilting Center. 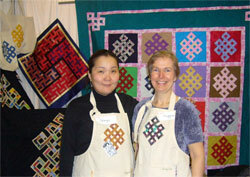 I returned in June 2006 to help organize the first International Quilt Show in Mongolia. With the support of my church, St. Barnabas Episcopal church, Bainbridge Island, I headed a capital campaign in which we raised $80,000 to purchase a permanent facility for the Mongolian Quilting Center. In 2009, I had the joy of visiting the new Center and teaching there. I weny again in 2014 for another quilt show in celebration of the 10th anniversary of the Center. My work with the Center Director Selenge Tserendash and the Mongolian women is on-going, as I try to provide them as much support and encouragement as possible. Check out the Mongolia pages to read more. 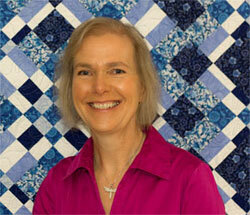 Many of my quilts are long-arm quilted by my good friend Wanda Rains. We have been collaborating for over 15 years and I love Wanda’s talent for selecting and beautifully executing the ideal quilting patterns to enhance my quilts. When I'm not quilting, I enjoy time with my family, gardening, natural history, walking, working out at Curves and singing. I'm active at St. Barnabas Episcopal Church where I sing in the choir. I’m also a member of Schola Nova, a women’s choir that sings unaccompanied evensong once a month. When I began quilting as a hobby, I never imagined that it would become a profession and provide me with so many amazing opportunities to travel and share my passion with others. 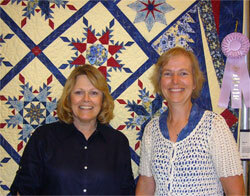 I love teaching and am known for my ability to work with quilters of all skill levels. It is great fun to see what each student brings to class and how they develop what I initiate. I always encourage my students to experiment and audition a variety of options. One of my favorite facets of quilting is the way any pattern may be presented in so many ways simply by the choice of fabrics, placement of different values and the orientation of block components within the block. Add onto this the numerous ways of arranging and setting the blocks plus borders and the creative possibilities for unique designs are endless. Quilting is awesome!